"I can't recommend them enough for all of your marketing and website needs." Ever wonder how National Search Marketing (SEO) can increase your traffic to your website or store? We start building National Search Marketing (SEO) Search Engine Optimization into your website from the construction of your new website or website redesign, ensuring SEO is built from the ground up. 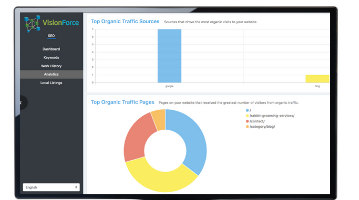 Campaign Monitoring: We monitor every SEO campaign to identify areas of improvement. We also provide monthly updates to your national marketing campaign to ensure your goals are being met. If you’re not being found nationally on the search engines or you want more visibility and more traffic you must get found on page one, in the top 5 spots. 65 % -70% of all clicks happen there. You could hide a dead body on page two. It's simple if you can improve your national ranking to at least get on the first page for your most relevant content and keywords with products or services you provide, your traffic will increase and so will your sales. If your national SEO is consistent and it has relevance for what potential clients are searching for, you're going to get high search engine results nationally. VFM National Search Marketing (SEO) is all about the end user and the experience you give your potential clients. We are constantly increasing your national SEO whether that’s by page content optimization, blogging, page building, link building and/off-site tactics. We ensure that the entire national SEO foundation is laid before we go into doing additional SEO work. We don’t just look at the page content for national SEO but we look at the title tags, meta descriptions, alt tags, and all descriptions. We look for any room for improvement within national Google rankings. This is really important to us and it has an endless amount of opportunity for our clients to grow in national organic search. Our team of dedicated National Seo Experts uses software along with real human analysis to get you higher rankings with the national search terms that are most important for your market. Are people finding your website and how? Because we focus on a national marketing strategy, in the beginning, we have a higher success rate with our friendly National SEO program. Most importantly we will help get you the highest possible national listings on all of the major search engines with a professional national search engine optimization strategy. So, what is Google looking for in your national SEO? Consistency and relevancy. By adding new content on a regular basis we can get google to crawl your website more often. Which will, in turn, increase your visibility and move your company up in national organic search rankings on search engines like Google, Bing, and Yahoo. Ranking higher on the search engines for national keywords is becoming increasingly difficult because of the updates Google has made. We always do the best national SEO “white hat” practices that are going to drive your company up the national search engine rankings. This will drive higher quality traffic than traditional SEO national keyword efforts performed by a website company or marketing agency because we are intentional and consistent with content writing. blogging, backlinking, and creating relevant for national SEO. Vision Force Marketing does more than just try to get your business ranking for the merit of nationally organic keywords that may or may not drive good traffic. We drive more, high-quality traffic with powerful content and blogging, geared toward your ideal client that was discovered from the Vision Force Marketing Strategy Formula™ which leads to increased sales. We don’t care just about the amount of traffic. We care about WHO the traffic is and WHO is walking into your business. We make the most out of the traffic to make sure it converts into leads and sales. HOW DO YOU TRACK YOUR LOCAL SEO WORK? 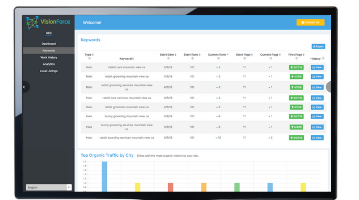 Complete transparency and measurable results: Our powerful VFM reporting dashboard shows you exactly where your businesses National SEO dollars are going. In a lot of National SEO programs, you don’t know what is being done and how effective it is. We have the software and the dedicated national SEO team show you where every dollar is spent and help you increase your ROI. In our VFM Local search and National Search Marketing programs, you have full transparency of the work being done through our software that you can access anytime. HOW DO YOU DETERMINE WHAT IS THE BEST NATIONAL SEO CONTENT TO CREATE? First before any website, SEO, PPC, logo, brochure, or marketing project we work with you on your overall marketing strategy with you and your top advisers to get the right SEO marketing map for your Local Search or National Search Marketing Program. Then we pull all sorts of real data to back up our findings. Sometimes, the best SEO data comes from your sales department or customer service department. So, it’s a balance between software and marketing discovery. WHO IS WORKING ON MY SEO? We have one team that’s dedicated to progressing through the actual growth of your website. One person is going to be assigned to your account so they will be able to grow with the account. If we are not seeing the progress we can analyze what needs to be done in order to get higher local rankings. We’re helping over 26,000 businesses boost their local and national search rankings and we manage over 61,000 keywords. This experience, coupled with our industry-leading technology, gives us access to vast amounts of data that keeps us ahead of other local and national SEO providers. Our powerful reporting dashboard shows you exactly where your national SEO dollars are going. We monitor every national SEO campaign to identify areas of improvements. We also provide monthly updates on campaign performance to ensure your goals are being met. National SEO is a never-ending endeavor. When you make it to the first page of the national organic search you’ll want to stay there. So, it is very important to be building your content on a continuous basis. The companies on the first page are winning the search engine optimization game and getting all the new customers nationally. VFM provides SEO services in English (North America, UK, Australia), French, and Spanish. SEO stands for Search Engine Optimization. It’s the work that goes into a website to make it appear higher in the results of search engines like Google and Bing. How does SEO work exactly? Search engines like Google look at two things when evaluating your website and deciding where to rank it - RELEVANCE and TRUST. RELEVANCE is the content of a website and the code behind the scenes. If your code is optimized and the content on your site is relevant to a search, Google will move you up in the rankings. TRUST refers to how many other sites on the internet are linking back to your site. If a large number of high-quality sites are pointing to you, Google will start to trust you and move you up in the rankings. Good SEO can’t be done overnight, it takes time. Many of our customers start to see results in 3-4 months. In fact, over 80% of our small business clients can reach the 1st page of Google after 6 months if the right conditions are met. Does SEO work for every type of business? Yes! As long as your business offers a viable product or service at a reasonable price, then SEO can move your website higher in search rankings and drive more sales. How will I know that SEO is working? We provide total transparency into all of the work that we perform. 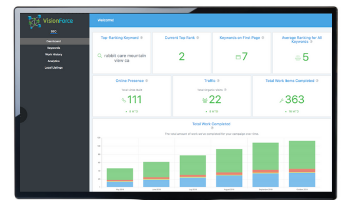 Each client is given access to a custom reporting dashboard that shows every single SEO action being performed both on and off their website. You will be able to track every dollar of your SEO spend, as well as monitor keyword movement and overall performance. We also provide monthly updates to all SEO customers to review campaign activity and performance, ensuring that your goals are being achieved. What tactics does Vision Force Marketing use to improve website rank? Keyword Optimization: It takes a lot to rank well for a keyword, so we do exhaustive research to find the very best keywords for your business. Website Optimization: We perform a full-service cleanup as well as exhaustive upgrades to the website code and user experience. Business Profile Development: To make sure Google and prospective customers know that the business is active, we create and maintain up-to-date profiles on trusted online business directories. Link Portfolio Development: Get the word out about the business. We help by creating a diverse portfolio of links to the website and place them in strategic locations all over the web—on popular industry sites, news sites, blogs, articles, and more. Custom Content Creation: We create and post high-quality content that will keep the website fresh and at the top of the search rankings and keep potential customers interested. 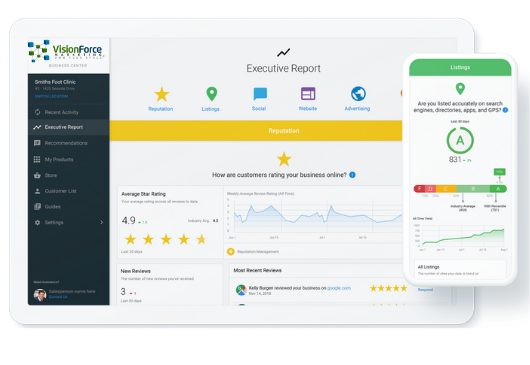 Service and Performance Reporting: We provide reporting tools that show businesses at-a-glance how their campaign is performing as well as an in-depth review of all the work we’ve done on their behalf. Campaign Monitoring and SEO Consulting: Our goal is to help your business succeed online. To help achieve this we actively monitor every SEO campaign to identify areas for improvement. We also provide monthly consultations to review each campaign and ensure client goals are being met. Can I cancel my other forms of advertising and just use SEO? We do not recommend using SEO as a replacement for what you’re currently doing. SEO compliments other forms of advertising like print and radio, and you will see the most impact by adding SEO to your current marketing efforts. What countries does Vision Force Marketing operate in? VFM provides SEO services for business owners in the United States, Canada, New Zealand, Australia, and the UK. How are the keywords chosen? The keywords we suggest are unique to every business and are based on extensive research. We consider many factors including your specific products or services, industry, location, competition, and more. Our goal is to find the keywords that will provide the most impact for your business, regardless of the package you choose. Get this in-depth & complete custom marketing report on how you can beat your competition and dominate your marketing!